Thus, “Abraham's Bosom” is a term of endearment, not a literal place. Galatians 3:29, “And if ye be Christ's, then are ye Abraham's seed, and heirs according to the promise.” All of God's promises to Israel in the Old Testament apply to born-again believers. The Scriptures are very plain that there is neither Jew nor Gentile in Christ. Galatians 3:28, “There is neither Jew nor Greek, there is neither bond nor free, there is neither male nor female: for ye are all one in Christ Jesus.” No unsaved Jew will ever enter into the Kingdom of God, and no saved Gentile will be left out! 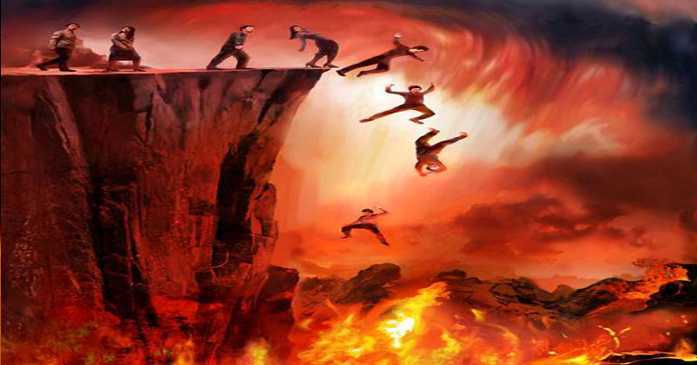 No unsaved Jew will escape the fires of Hell, and no saved Gentile will miss the blessings of Heaven! Some Bible students believe that Jonah died and went to Paradise for three days and nights, but I disagree for a couple reasons"
Jonah was doing a lot of praying and thinking while in the whale's belly. Jonah 2:1, “Then Jonah prayed unto the LORD his God out of the fish's belly.” This ole boy was having a personal one man revival, I'll tell you for sure! Also, there is another piece of Scriptural evidence that a place called Paradise exists. John 3:13, “And no man hath ascended up to heaven, but he that came down from heaven, even the Son of man which is in heaven.” At the time Christ walked this earth, NO MAN had ever ascended up to Heaven the Bible says. Well, if the saints didn't go to Heaven in the Old Testament, then where did they go? The man of God, Enoch, was taken that he should not see death. The prophet, Elijah, was caught up into a fiery whirlwind (firenado) into heaven (2nd Kings 2:11). The word “heaven” in 2nd Kings 2:1 and 11, refers to the sky, not the celestial city of Heaven. We must not go by human logic or what seems reasonable, but by the plain teachings of the Scripture. The Bible plainly tells us in John 3:13, spoken by Christ Himself to Nicodemus, that NO MAN before Christ had ascended up into Heaven. Since Elijah ascended up into “heaven,” the Lord could not have been referring to the same place, or the Scriptures would be in error. The Holy Bible is never wrong!!! So Jesus clearly meant that no man had ever ascended up into Heaven where God is seated on His throne. The only logical conclusion, based upon Scriptural evidence, is that a literal place existed in the Old Testament, where saints were held until Christ ransomed them. This place is Paradise, which is located in Hell (Hades), as evidenced in the true account given in Luke 16:19-31 of the rich man and Lazarus. To clarify, I am NOT talking about the ungodly Roman Catholic heresy of Purgatory, which is a manmade doctrine fabricated by Gregory the Great in 593 AD. There is no temporary place of punishment for believers. Once a person dies, it's over! You either “DIE IN THE LORD” (Revelation 14:13), or else you “DIE IN YOUR SINS” (John 8:24). Once your spirit and soul depart from the tabernacle of your earthly body, your eternal fate is sealed, and it cannot be changed by anyone, not even God, lest He break His Word. In the preceding Scripture, we see the need for repentance. Humans are sinners by nature and by choice. The Holy Bible teaches that mankind because of his love for sin (evil) won't come to the light of the Gospel to be saved. Repentance is when a person acknowledges being a guilty sinner in the sight of a holy God (Romans 3:19-20), and that person turns to the Good News of Jesus Christ crucified, buried and risen (1st Corinthians 15:1-4)! Repenting and believing are ONE ACT, not two. You don't repent AND believe; but rather, you repent TO believe. If you get this truth wrong, you will go to Hell. To repent as a separate act is manmade reformation, which constitutes human effort (works) for salvation. Grace plus anything crosses out grace! We are saved by BELIEVING, not by REPENTING; but no one has ever believed who didn't also repent! Repentance is an automatic thing, so that you don't even need to mention the subject when witnessing to a lost person. John 20:31, “But these are written, that ye might believe that Jesus is the Christ, the Son of God; and that believing ye might have life through his name.” In the Gospel of John, which is God's Gospel tract, the words “believe” and “believed” and “believeth” are mentioned 87 times, but the word “repent” is not mentioned even once! That is because the person who BELIEVES the Good News (Gospel) of Christ crucified on the cross, buried and resurrected three days later, has also repented. There is NO SUCH THING as a person who believes but has never repented. I hear corrupt preachers, like Pastor Charles Lawson, teach that if a believer is still living in willful sin, it may be because they have never repented and are not saved. That is unbiblical! A man who believes is saved, period, end of story! I am so sick of meddlers changing the Gospel in an attempt to force people to live right. God's salvation doesn't work that way! Repentance is simply “a change of mind” unto the Gospel itself. How do I know if I have repented? Look, if you have trusted Christ's sacrifice on the cross as the only payment for your sins, believing that He raised up from the dead the third day, you have repented! You are born-again by the Holy Spirit of God!!! esus bled, suffered and died on the cross, so that you wouldn't have to be punished for your sins in Hell for ever and ever! If you go to Hell someday, you'll have nobody to blame except yourself! Please get saved before it is too late. Death can come at any moment! NOBODY IS LAUGHING IN HELL!!! Did you know that you don't have to ask Jesus to save you? God has already told you how to be saved, that is, by simply believing that His Son died on the cross for your sins, was buried, and raised up from the dead three days later. Christ raised up from the dead, which means that God the Father accepted His Son's payment for the sins of the world. Christ suffered on the cross so that we wouldn't have to suffer in a literal Hell forever. Amen! You don't have to bow your head to be saved. You don't have to pray. You don't have to do anything except believe that Jesus died on the cross for your sins, and make that your only hope for Heaven! How Permanent Is Your Salvation?